There was much public distain about that particular newspaper. Brave independently minded commentators attacked it, residents didn't like paying for it and eventually even the Conservative-led government turned against it. Then, to everyone’s surprise the publisher suddenly closed it down. It is just over two months since the Council’s H&F News disappeared from our Borough. Some said it was the most controversial government self-promotion outside of North Korea. For too long H&F’s Conservative Administration refused to even countenance that but in the end, even they agreed it had to go. “Political propaganda on the rates” was supposedly dead. 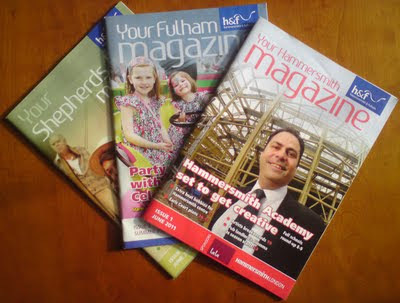 However, next came the alarming deal with the Fulham and Hammersmith Chronicle. Now, there’s three, all-new, expensively produced, glossy council magazines dropping through our mail boxes and paid for by our taxes. Many of the same staff work on these new titles and they are packed with pictures of Conservative councillors doing "good works" around our community. Kim Jong-il would be proud and if Rupert Murdoch is watching these three phoenixes rise from H&F News’ ashes, he may conclude he could learn a thing or two from the sly goings at Hammersmith and Fulham's Conservative run Council. The new version of the H&F News is totally inappropriate H&F propaganda magazine at a time when we are all faced with cutting costs and essential services. How much does the new H&F news costs (at the taxpayer's expenses)? Newspaper publishers truly comitted to information and education would do better to support local libraries than such propaganda. Does this mean that the Chronicle's editorial will no longer be following the official Pravda line? I would love to know how to advertise in my local version of the magazine - oh wait, they will probably still censor us and cite 'new regulations'!